This is an old piece on a critical American value now being questioned. Where did our ideas of separation of Church and State come from? This core value is older than the United States itself – and comes from a different place than many expect. It naturally comes up in my family just before Thanksgiving every year. The Puritans’ deliverance to America is billed as a search for religious freedom, something which is a core value of our nation. It’s good that we celebrate such a thing, but do the Puritans really deserve credit for it? The short answer is no, they do not, because they were seeking to establish their own theocracy – and across the ocean where no one would bother them seemed like the perfect place. 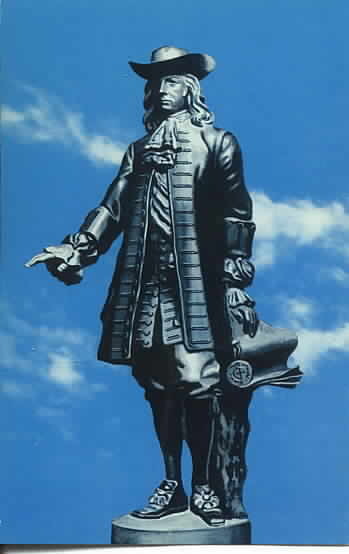 Religious tolerance as a founding principle of America came from a different source – William Penn, the “absolute proprietor” of Pennsylvania. The reason that he doesn’t get the credit he deserves is murky at best, but may have its origins in a prejudice that most of us wouldn’t even understand today. I think it’s time to correct that. William Penn is an important figure in my family for many reasons. I am, at heart, an ethnic Pennsylvanian, which is to say that as far as I can go back into the mists of time my “people” lived there. On my mother’s side the story is one of the great moments in American history. The year was 1680. The Anabaptists, people we call Amish and Mennonites, were crammed into the Netherlands because this was the only place that would take them. The Thirty Years War had been over for 42 years, but for this group the devastation would not end. That war saw their land trampled by armies moving back and forth across what is now Northwestern Germany, leaving the entire area nearly depopulated in a fierce religious war between Catholic and Lutheran forces. When it was over the warring parties agreed to respect each other, but left no space for religious dissidents who weren’t of either side. The Anabaptists, so named because they do not believe in infant baptism but instead reserved it for adults, are literal Bible readers. They take the word of Jesus seriously and are strictly pacifists. They also refuse to swear allegiance to any nation because they believe that nothing should stand between them and God. The roving armies of both sides who conscripted soldiers at will came to regard the Anabaptists as nothing but troublemakers. Many leaders were burned at the stake as heretics. They fled to the Netherlands even though it meant abandoning their simple farming based on following Jesus’ teachings as an example. Exile life in the cities was hard, but at least they were not being slaughtered for their beliefs. 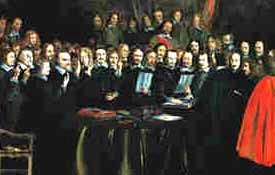 Even after the Treaty of Westphalia was signed in 1638, ending the war and recognizing the rights of Lutherans and Catholics alike, Anabaptists were left out. They were still heretics who had to seek refuge. In 1680 that all changed when a man arrived to speak to them. He was William Penn, and was looking for settlers to join his utopian vision of a land where people could be free to live and worship as he saw fit. Laying out the vision of Pennsylvania to the Anabaptists was only one stop on a grand tour of Europe made by Penn as he scoured the continent looking for the downtrodden and marginalized. But their desperation led them to consider the offer more completely than nearly any other group. One night the elders got together and voted on the proposal to leave the Netherlands and head out to America. Penn’s offer was approved, and they all packed up and left. Every single one of them. There is not an Anabaptist left in Europe. Today, the Amish are a symbol of Pennsylvania – or at least the part of it centered around Lancaster County. People flock from the cities of the East Coast to gawk at the buggies and hats and … to be honest, I never understood what the attraction is. To me, these are my relatives. My grandfather left the faith and joined the army in World War I for reasons I never understood, and I have second cousins who are Amish. That’s another long story I’ll have to tell sometime. I’ve been saving it for the memoir. The real question, however, is that with all the attention focused on the simple life, why is the amazing story of their arrival almost never told? Why doesn’t Penn get the credit he deserves for our founding principle of religious freedom? I think it comes down to the simple fact that, as pacifists, the Quakers had a tough time during our Revolution. Their opposition to war made them appear suspicious at best – and perhaps even Loyalist. They were largely removed from political power in the wake of our Revolution and their contributions diminished. Today, very few people regard Quakers as trouble at all, even if pacifism is still not particularly popular. Yet we still rarely give William Penn and his grand recruitment of the downtrodden of Europe its proper place in our history. It was a great moment that defined us like no other. This Thanksgiving I hope that you can spend some time contemplating deliverance to a land of freedom – and the tremendous effort it took to make it possible. This entry was posted in People & Culture and tagged religious freedom, separation of church and state, Thanksgiving. Bookmark the permalink. I like this piece but you don’t explain the connection, if any, between quakers and anabaptists. It’s been my impression that the quakers lost political power in PA partly because the Penns did, and partly because they lacked adequate enthusiasm for making war on the Indians in the Western part of the state…. Is this wrong? I think most Americans don’t realize how their present day freedom came to be. What if the Anabaptists had been wiped out and we were still all Catholic or Lutheran?